We are striving to lower negative impacts on the environment. Environmental management is one of our highest business priorities. Kolektor Tesla Jihlava s.r.o. 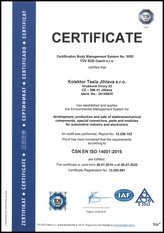 is among others a holder of the ISO 14001 certificate - since 2003.